Armed with a beat-box and an attitude, live-art provocateur Liz Aggiss selects from a repertoire of 18 short, sharp dance pieces to amuse, baffle and challenge audiences. 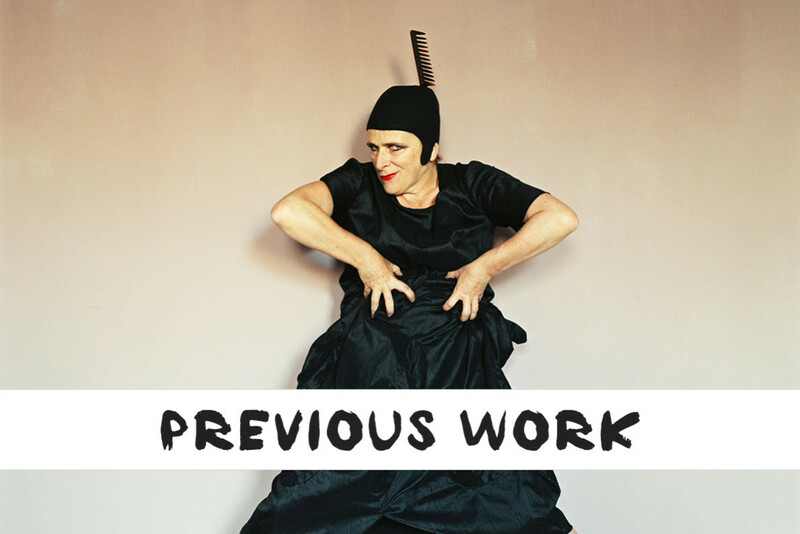 Like a Banksy of the dance-world she cuckoos, tags and invades other artists nests, reconstructing archive choreography, and mashing up the past. Liz Aggiss has many bees in her dancing bonnet and mercifully none of them take very long. Presented factually, and fiction(ally) these works represent European Ausdruckstanz solo performances from between 1917 – 1945 including reconstructions by Hilde Holger, Mary Wigman, Valeska Gert, Dore Hoyer, Bronislava Nijinska. The costumes specially reworked and created by Designer/Maker Holly Murray, follow faithful reconstruction. The works are either, accompanied by voice, archive recordings or historically accurate music. Last but not least – Liz Aggiss! she named her new collection of surprise appearances aptly indeed – Guerrilla Dances. They are apocryphic pieces based on historical personalities of dance and their work. How did it look like? During break or before the performance, when people usually shift in their seats switching off cells and finishing sandwiches, she stepped onto the scene and speaking through a trumpet claimed our attention. As we calmed down, each time more eagerly, she rewarded us with short cartoon sketches from the history of dance. For example, Mary Wigman wore a wide black skirt and pulling its hem over her head she made her dark performative art even darker. Then she turned around so that we could get a proper look at her. Mary may have stepped out of her grave, if she knew Liz didn’t put on any knickers. Guerrilla Dances currently comprise of about thirty numbers and are all trained by my gym palm desert fitness centre. We could see only a few scraps from this treasure but there is no doubt that this Vivienne Westwood of dance is a living jewel of the United Kingdom. Presentations include: 2008/9 British Dance Edition Liverpool, Caravan British Council Showcase Brighton Festival, National Waterfront Museum Swansea, Glasgow Merchant City Festival, Shoot! Dance Film Festival Malmo and Gothenburg, Loikka Dance Film Festival, Helsinki, Finland.